Bright Tabor. His initials are carved over the living room fireplace. Henry A. Crane lived here at least from 1888-1893. Lumber industry. Theodore Fassett lived here at least from 1898-1908. Lumber industry. The great sloping roof is punctured by a massive tower with a reverse roof. Palladian window on the third floor. The two and one-half story Queen Anne/Shingle style residence with its unique massive tower has been much photographed and written about; nevertheless, much about it is a bit of a mystery. The house is thought to have been built circa 1885 for Henry Crane, who was listed as occupant from about 1888 to 1893. Following Crane as owner-occupant was Theodore Fassett, who lived in the house from 1898 to 1906. Both men were lumbermen, who, from wide evidence in the interior, saw to it that fine woods were extensively used throughout. The design has been attributed to Joseph Lyman Silsbee of Silsbee & Marling Architects, but even that attribution is not without dispute. Silsbee began his career in Syracuse and eventually had offices in Buffalo and Chicago, where he was Frank Lloyd Wright’s first employer. 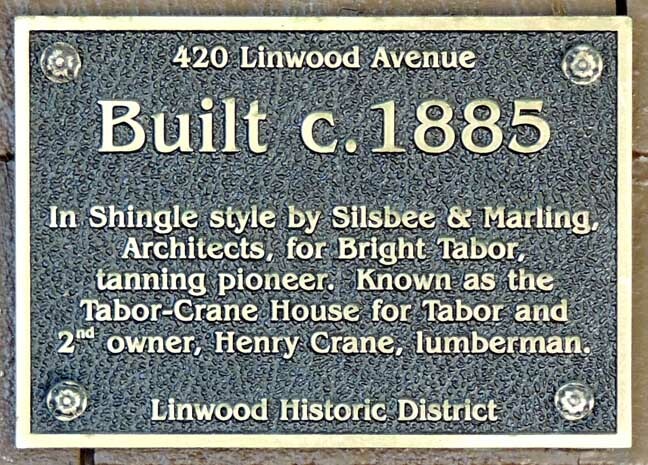 After the Silsbee & Marling partnership broke up in 1887, by which time Silsbee was in Chicago, James H. Marling, in partnership with Herbert C. Burdett, a former apprentice to H. H. Richardson, claimed the Crane House as his design. It is felt by some scholars, however,that a Silsbee-Marling collaboration was likely. 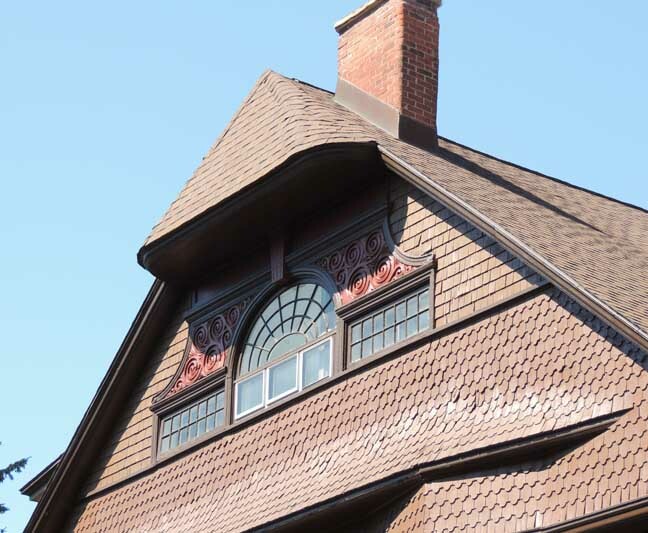 The “great sloping roof punctuated by a large tower … helps to unify the great size of the house by emphasizing the horizontal plane,” is the way architectural historians in Buffalo Architecture: A Guide (p. 154) describe the house. 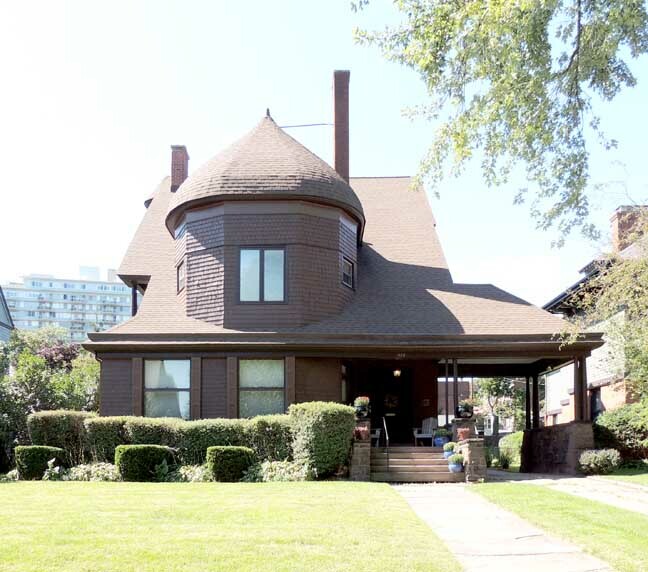 Dominated by a Richardson Romanesque tower of a type popular toward the end of the last century, this structure at 420 Linwood Avenue in Buffalo once was the home of local lumber magnate Theodore Fassett. Mr. Fassett, an officer in several early telephone companies, as well, died in the house in 1908, of a hear attack suffered while he was sleeping. His business career made him one of the leading lumber dealers in an area that once led the world in lumber exports, and at the time of his death he was the senior partner in the firm that had taken over and developed the lumber industry on Tonawanda Island. His Linwood Avenue home stands as one of a few local examples of a tower construction with a "candlesnuffer" rood, breaking up the horizontal lines of open porches and carriageways.